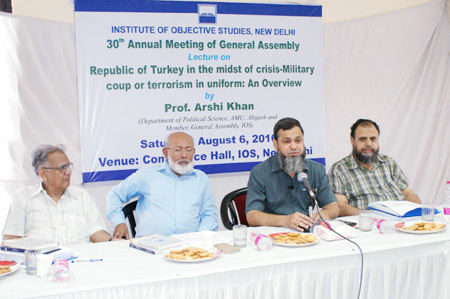 The Institute of Objective Studies organised a lecture on “Republic of Turkey in the midst of crisis-Military coup or terrorism in uniform: An Overview” on the occasion of the 30th Annual Meeting of its General Assembly at its conference hall on August 6, 2016. 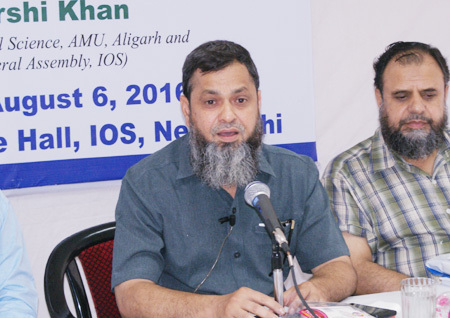 Delivering the lecture, Prof. Arshi Khan of the Department of Political Science, AMU, Aligarh observed that the Republic of Turkey took its rebirth in a decisive form on July 15, 2016 to re-engage itself in nation-building process and restructuring the Turkish state for greater security, stability, development and peace. He said that the Turkish people witnessed a new kind of terrorism on the night of July 15 in different parts of the country when attempts were made to capture or kill the Turkish president Recep Tayyip Erdogan and damage the state. About one percent of the Turkish army was involved in the destructive attempt to overthrow the government, but the active, sincere and historic stand of the common people in the streets saved the republic from falling into an unending turmoil and chaos. He held that despite the success of the terrorists to capture power for a few hours through self-proclamation, the Turkish president appealed to the people to save the nation from the plotters. People succeeded in restoring democracy, peace, stability and unity in the country. He held that this new type of terrorism cost the country men and material. He referred to the president’s accusation of “mastermind” and “pawns”, for the damage. But the Erdogan bashing of the West continued, he said. 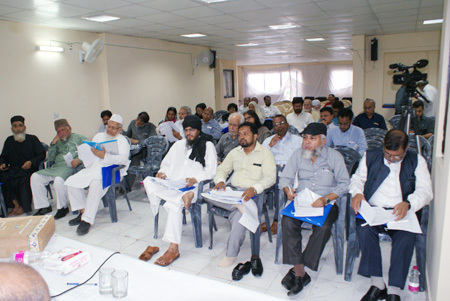 Commenting on the age-old relations between India and Turkey, Prof. Khan said that it was Maulana Mohammad Ali Jauhar who led Indians’ protest against the abolition of the Caliphate in 1923 and condemnation of the British action. Some political observers were of the opinion that Erdogan himself staged the coup in order to purge the armed forces, judiciary and the bureaucracy of the elements inimical to him who owed allegiance to the exiled leader, preacher and his ex-political ally, Fethullah Gulen, has been residing in the US. With a chain of schools he was spreading his ideas across the country. He held that the country had already experienced military coups in 1960, 1971 and 1980. The damage to the security establishment could be gauged from the fact that the police headquarters at the capital city of Ankara responsible for internal security was completely destroyed. He said that the exemplary valour displayed by the people to save the country from instability was noteworthy. Turkey had some problem on its border with Syria where Islamic State’s (IS) strong presence was causing concern. Similarly, its forces were engaged in skirmishes with Kurd rebels. Military confrontation with the Kurds had become a regular feature in Turkey. Despite all this, Turkey was recognised as a powerful and developing country, an important member of the NATO (North Atlantic Treaty Organisation). Turkey housed NATO’s 2.5 percent nuclear arms stockpiles. Relations between Russia and Turkey worsened following the shooting down of a Russian aircraft by the Turkish army. But with regret expressed by Erdogan for the incident, relations between the two countries again normalised. Prof. Khan also pointed to a conspiracy theory which said that the secretary to an influential army commander was behind the coup attempt who used to update his boss with every information. Erdogan had also made up his mind to take action against some of his partymen. It was also rumoured that the US army general Campbell was actively behind the abortive bid to overthrow Erdogan. He was said to be planning the coup for the last eight months and had definite information of whatever happened there on July 15, 2016 beforehand. Referring to the system of governance in Turkey, he said that modern Turkey was not an Islamic republic but a secular state where every community enjoyed religious freedom. This was perhaps due to Turkey’s trade relationship with Europe. Germany being the largest trading partner of Turkey, half of its trade was done with Europe. According to Prof. Khan, Turkey had become more assertive after the failed coup. During cold war, Turkey assumed special interest among European countries as it worked as a shield against Communist onslaughts on Europe. He foresaw perceptible policy shift in several West Asian countries after the unsuccessful military coup. The notable feature of the coup, he said, was that all political parties of Turkey stood solidly behind Erdogan during the crisis. Prof. Khan explained that the stability of Turkey mattered to the European countries most. Turkey had relations with Balkans, Caucasia, Macedonia, Caspian Sea area, etc., he concluded. Earlier, the Asstt. 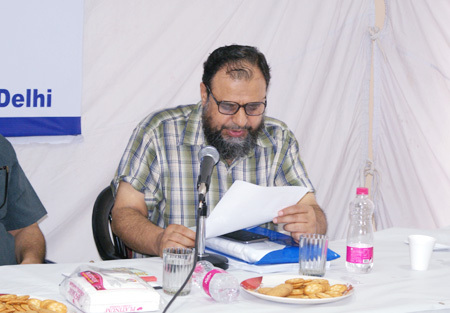 Secretary General, IOS, Prof. M. Afzal Wani read out a message from the Turkish ambassador to India, Burak Akcapar, which read: “Turkish nation stands firmly behind its democratically elected President, Parliament and Government. On the night of July 15th they have written a new chapter in history by facing tanks and aircraft and stopping a coup attempt. The coup plotters unleashed terror upon the Turkish people. 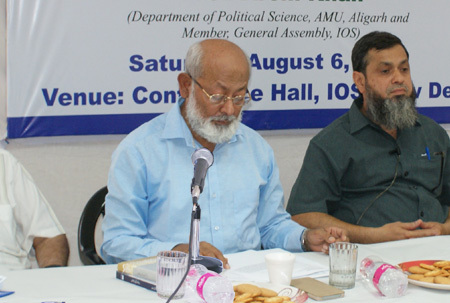 They martyred over 200 citizens, mostly civilians, whose only weapon was their commitment to democratic Turkey, their courage and their faith………I thank the Institute of Objective Studies and Mohammad Manzoor Alam Sahab for organising this important event. I send all organisers and participants my profound respect and warmest greetings and heartfelt gratitude for strong solidarity with Turkey”. In his presidential remarks, Chairman, IOS Dr. M. Manzoor Alam, while praising the democratic system of Turkey, said that the country was inhabited by many ethnic groups of Europe in complete harmony and in the spirit of brotherhood. People of German and Russian origin constituted a sizeable population among them, he added.